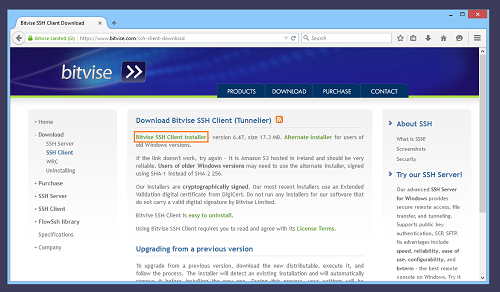 When to install Bitvise SSH Client? You wish to connect from a Windows computer to a remote SSH or SFTP server. 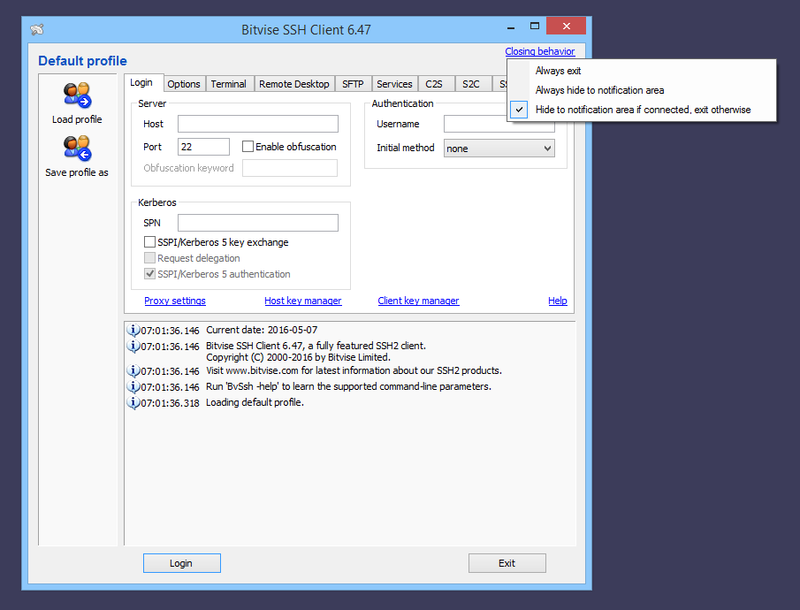 The server you connect to does not have to run Bitvise SSH Server. Our SSH Client can connect to most any SSH or SFTP server. However, a server has to exist, and you need to have access information for this server. Bitvise does not provide servers to connect to. If you were not provided information by someone to access their SSH server, you will need to set up your own server. The focus of this guide is to demonstrate use of Bitvise SSH Client as part of setting up and accessing Bitvise SSH Server. 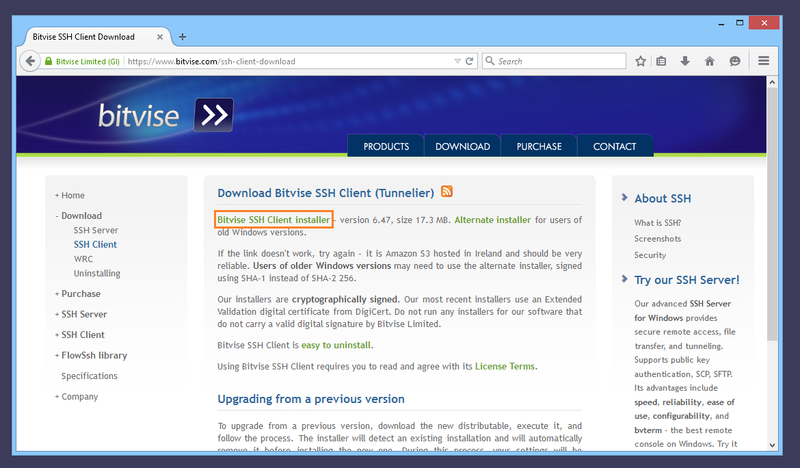 Aspects of this guide may also apply to use of the SSH Client with other servers. Where to install the SSH Client? Install it first on the same computer where the SSH Server is installed. It normally does not make sense to connect to an SSH server on the same computer. However, if you are setting up an SSH server, ensuring that it can be accessed from the same computer is an important step in verifying that it works. Subsequently, install the SSH Client on another computer in the same LAN. Use this installation to verify that the SSH Server can be accessed from another computer in its local area network. Finally, install the SSH Client on the computer from which you want to access the SSH Server. This can be a computer across the internet. For information about changes in SSH Client versions, consult the SSH Client version history. 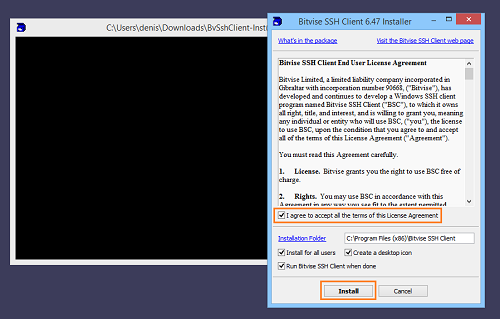 You will need to be logged into Windows with administrative permissions to run the SSH Client installer. 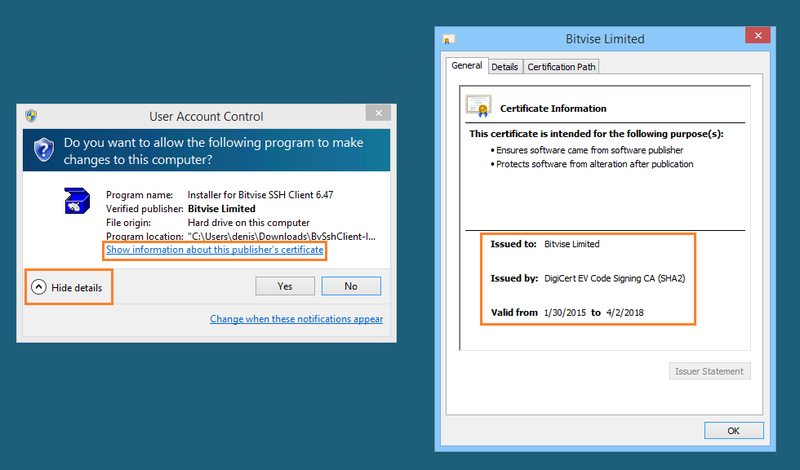 Before approving it to run, verify Bitvise's signature on the SSH Client installer. From the Windows Start menu. By double-clicking its desktop icon (if you chose to create one during installation). By double-clicking an SSH Client profile: a file with a .tlp or .bscp extension. Once you start it, you can of course also pin the SSH Client to your Windows task bar. If your notification area icons are hidden, you may not notice that you already have numerous SSH Client sessions active. Use sftpc for command-line file transfers. Use stnlc for unattended port forwarding/tunneling. Use stermc for a command-line SSH terminal client. Use spksc for command-line management of authentication keypairs configured for a user at an SSH server.